Adelaide, South Australia, 09 March 2018 – SolarReserve and OZ Minerals have entered into a long term agreement to commission a new high voltage electricity transmission line in South Australia. The high voltage power line will meet the companies’ current operational requirements and accommodate their growth strategy for the region. Collaborating on a single transmission line to support current assets and future growth also helps protect and respect the environment and Aboriginal heritage by minimising impacts on the landscape. The new line will support SolarReserve’s Aurora Solar Energy Project as well as OZ Minerals’ Prominent Hill mine and Carrapateena project, all of which will create thousands of jobs for the State. 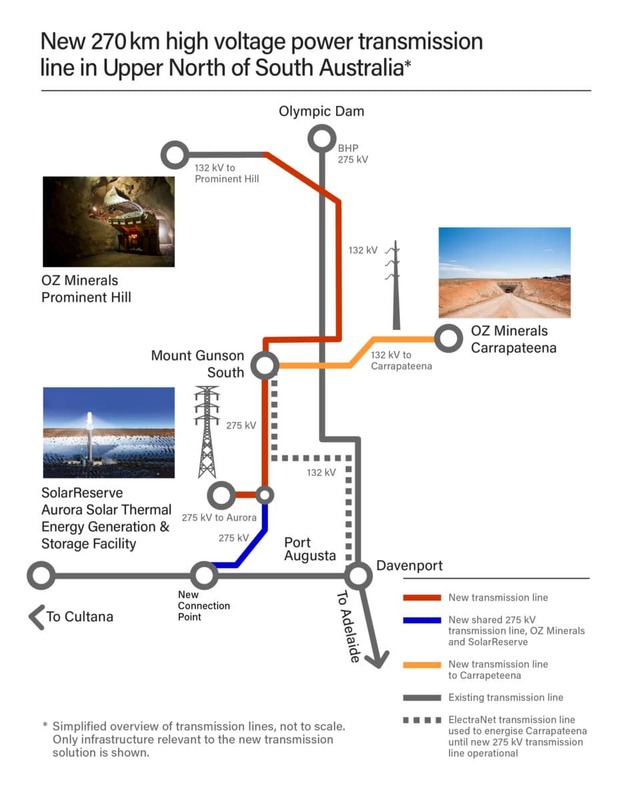 “We are excited to partner with OZ Minerals in this key initiative that brings together two private companies to develop a major piece of infrastructure for South Australia, resulting in a well-thought out project that will meet today’s needs and enable tomorrow’s opportunities,” said SolarReserve’s CEO Kevin Smith. SolarReserve hopes to build six solar thermal projects in South Australia over the next ten years, with the goal of building a new industry that boosts the State’s economy and provides South Australia with affordable, and reliable clean power. In total the line will be 270 km long with OZ Minerals and SolarReserve equally sharing operational costs for the first 35 km of the line. ElectraNet has been engaged to provide preliminary services for the design and tender of the new transmission line solution. This preliminary work is underway with the line expected to be operational by mid-2020. SolarReserve is a leading global developer, owner and operator of utility-scale solar power projects, with more than $1.8 billion of projects in operation worldwide. The company has commercialised its proprietary ThermaVault advanced solar thermal technology with integrated molten salt energy storage that delivers renewable energy that is dispatchable 24/7. The technology is now one of the world’s leading energy storage technologies, and allows solar energy to operate like traditional fossil-fired and nuclear electricity generation – except the fuel is the sun which means zero emissions, zero hazardous waste, and zero dependence on fuel price volatility. Since the company’s formation in early 2008, SolarReserve’s experienced team has assembled a pipeline of over 13 gigawatts across the world’s most attractive, high growth renewable energy markets. SolarReserve is headquartered in the U.S. and maintains a global presence with six international offices to support widespread project development activities across more than 20 countries.